JAKARTA, Aug. 20 (Xinhua) — Indonesian President Joko Widodo and visiting Prime Minister of South Korea Lee Nak-yeon met here at the State Palace on Monday, calling for acceleration of the Regional Comprehensive Economic Partnership (RCEP), a minister said. Indonesian Foreign Minister Retno Marsudi told reporters after the meeting that both leaders think it is necessary to bolster cooperation at bilateral and regional levels amid the global economic uncertainty. 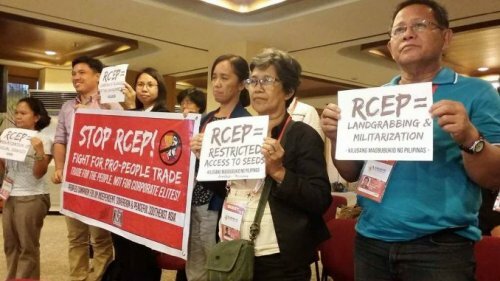 "The two leaders look to the acceleration in the negotiation of the RCEP. When it is completed, it will send a strong message that the economic integration in Asia runs smoothly," she said. Retno was upbeat that the acceleration to complete the talks would end in several months ahead as some differences in the negotiation have narrowed recently. "The gap must be persistently trimmed. Obviously, we hope the talks end at this year end, still we need to see the progress," she said. RCEP is a proposed free trade agreement between the the 10 members of the Association of Southeast Asian Nations (ASEAN) and the six countries with which ASEAN has existing free trade agreements — China, Japan, South Korea, India, Australia and New Zealand.